Custom Imprinted Half Frame Oahu Sunglasses are available in Blue, Black, White and Red color options. The trendy half-frame style is the main highlight of these custom sunglasses presented in one size fits most adults. UV400 protection makes sure that these custom Oahu sunglasses are not only visually appealing but they are efficient for the outdoor use too. Use it in outdoor events, fundraisers, and lots of other occasions. Order fast to get free proofs and free artwork design services. 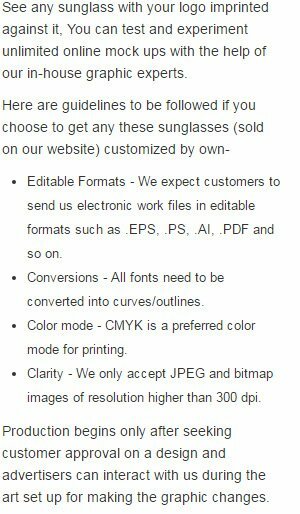 Request a quote to know the value savings that you can avail on bulk orders of Custom Imprinted Half Frame Oahu Sunglasses.